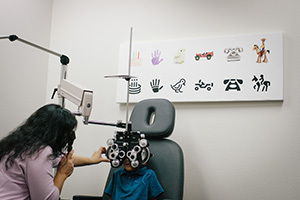 Our center is dedicated to helping children and adults treat a variety of vision problems that cannot be corrected with regular eyeglasses and contact lenses. This includes treating lazy eye (amblyopia), eye turns (strabismus), and a variety of eye coordination and eye movement disorders, as well as vision problems that interfere with reading and learning. We are always ready to help with scheduling or anything you may need during your time with us. We will take extra care to listen to your concerns, answer your questions and thoroughly explain your condition and treatment options. To schedule an appointment, please call us at (702) 998-8798 or use our online Request an Appointment form. 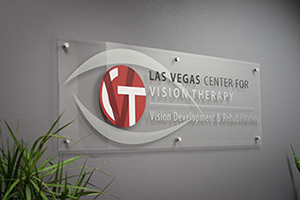 The Las Vegas Center for Vision Therapy does not accept assignment from insurance companies and is considered a private pay or out-of-network provider. All fees are the responsibility of the patient/parent/guardian. We require payment in full at the time of service. If your insurance does cover the initial evaluation and/or vision therapy, we will provide you with the necessary information so you may file with your carrier for reimbursement. Our office accepts cash, checks, and credit cards. Patients may also utilize Care Credit, Health Savings Accounts and Flexible Spending Accounts to pay for evaluations and vision therapy. To help speed the initial registration and familiarization process, we have made our new patient forms available for download here. Click on the links below to print and fill out the forms at home. Please fax or email them to our office prior to your appointment.